No Fenders -Formula 1, IndyCar and A Whole lot more..: Happy Freakin’ New Year! Talk ‘bout ringin’ in the New Year in style… All I can say is: Yo Travis! You’re ‘Juan SIC Puppie! So in case you haven’t heard yet? Last night Stuntman extraordinaire Travis Pastrana became the latest Daredevil to ring in the New Year in another mind-bending stunt put on by Deeter Majestic’s ‘lil ‘Ol Drinks Company better known as Red Bull… As the plan was for Travis to smash the existing Rally Car jump record of 171 feet set in 2006 by Rally America Teammate Ken Block, as apparently somebody had just beat Pastrana to his original goal of being first to jump 300 feet with a jump of 304’. But Travis’s jump would be even more impressive as he planned to jump his Subaru Rally Car off of the Pine Street Pier over 250 feet onto an anchored barge in Rainbow Harbour in Long Beach, CA at midnight, eastern (Right-coast) time to ring in the 2010 New years in style! In case you’ve never heard of the 26yr old Maryland native Travis Pastrana, he first burst into the limelight 10yrs ago at the newly minted X-Games, where he was stripped of his Gold medal and prize money for celebrating his accomplishment by jumping his motorcycle into the San Francisco Bay at the tender age of 15! Yet Pastrana is no stranger to injury, having suffered 50+ broken bones in his career along with 20 concussions, not to mention separating his spine and being in a coma for three days; as you name it, he’s probably broken it! Along with two back operations he’s had his left knee surgically repaired nine times and his right knee six; as apparently Travis is after Lee Majors fictional 6 Million Dollar Man role, eh? So, ESPN’s 1hr show was a bit more palatable, albeit I got really SICK of the “Stick ‘N Ball” references… As I kept feeling like they were trying to DUMB IT DOWN for all of ‘dem Sports Fans who DON’T watch any Motor Racing activities… Although it was good to see Jamie little once again; even if she was part of the let’s HYPE the SHEISA outta this routine. And finally the hour of the jump had come, as just prior to Midnight ET the Subaru was fired up, and it sounded NASTY! With a sweet ARSE bark, as Travis teased the approx. 20,000 spectators with a few warm-up runs before it was finally GO-TIME! As I really liked the added reminder in the cockpit: Turn Air ON! As Travis’s Rally Car was fitted with an oxygen tank in case he hit the water at 6-G’s and needed to be pulled out by Frogmen, he’d have a ten minute supply of breatheable air, while further safety considerations included the deletion of his Rally America Navigator, with 120lbs of lead ballast inserted into the right-hand seat instead. And then he was off! And TANK GAWD the Announcers SHUT-UP and let us just listen to that NASTY sounding Subaru accelerate down the pier and fly into the sky some 220+ feet before landing on a “Slick as Snot” ice rink of a landing ramp on the awaiting 240 foot Barge, as the night’s air dew had moistened the 40 foot wide landing ramp in the awaiting darkness… Before Travis pitched the WRX Sti sideways for an impact with the catch fence safety wall designed to arrest the hurtling Rally Car! 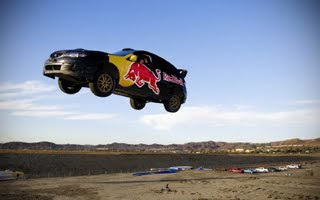 As Pastrana triumphantly extricated himself from the vehicle, walked to the end of the ramp and did a back flip into the harbor… After having just unofficially jumped 274 feet which was shortly recognized as an official new record distance of 269 feet, besting the previous record by 98 feet! So I guess it really does give you wings, eh? So while the Mainstream media continues to Ballyhoo the SHEISA outta Jimmy Johnson’s 4-Peat in RASSCARLAND… And the Speed Freaks Stat Mann Caruthers picked Tanner “DRIFT-THIS” Foust as his Freak ‘O duh Year! I’m giving the nod to ‘TA (Travis Pastrana), also known as the “Wonder Kid” who NOT only has won four consecutive Rally America Titles, but jumped a ‘Freakin Sube-ah-Roo 269 feet OVER water in the pitch dark… So take ‘dat Jimmy!